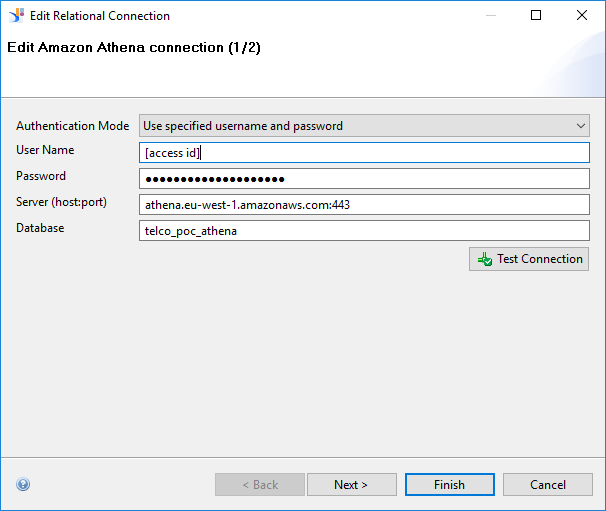 Amazon recently introduced an interesting big data product called Athena. In this post I will go through how to connect a BusinessObjects universe with it. Amazon manages all these, and charges only based on the queries that you actually run. In order to put this price in perspective; and to simulate a real word example: I have generated call detail records (well, sort of) of an imaginary telecom company with about 5 million active users, initiating about 5-10 calls/users/per day. I would like to analyze the last 90 days without pre-aggregation. So I ended up with more than 3 billion records, or about 12-15 GB compressed. With only 5$ you can probably run all the meaningful analytical queries on the full dataset. (60-80 queries) But if you partition and query your data wisely, you can get much more for your money. If the WHERE condition narrows down the “data to scan” to a single partition, you will only pay for the size of that partition. 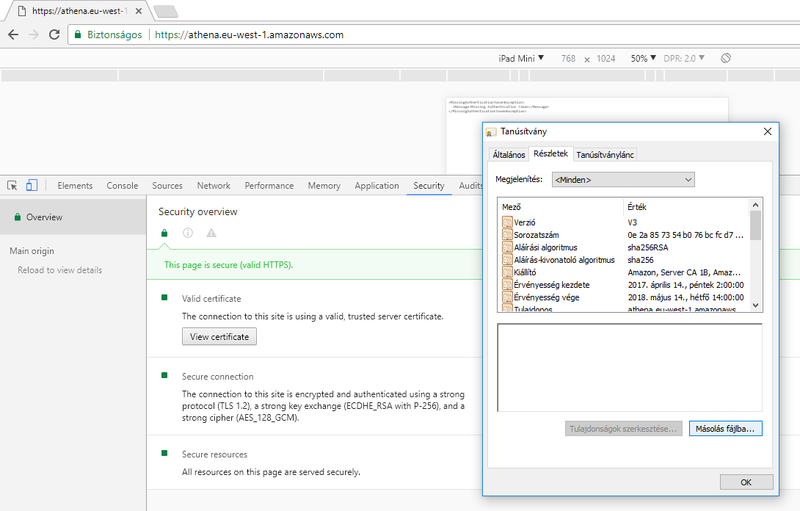 At first you need to create an AWS account (https://console.aws.amazon.com/console/home) and create an S3 bucket (https://aws.amazon.com/s3). Note that Athena is not yet available in all regions, only at: US East (Northern Virginia),US East (Ohio), US West (Oregon), Europe (Ireland). It’s best to create the S3 bucket in one of these as well. Once you have a bucket, you can upload your uncompressed data in CSV with simple drag and drop, or also with SAP BO DataServices. To achieve better performance and lower price, I recommend converting the plain CSV to a column based and compressed format, for example Parquet. 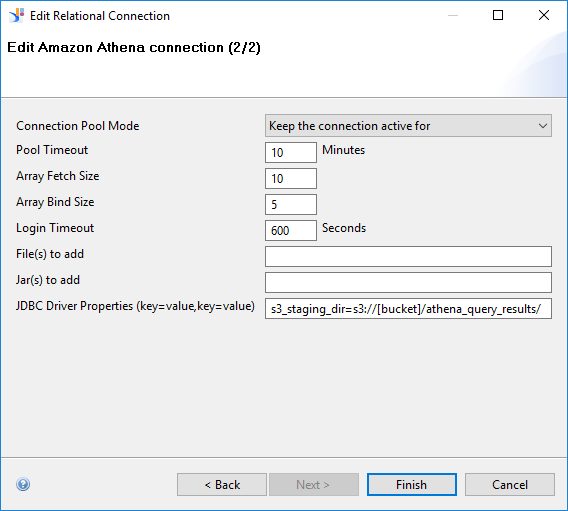 Before going further, as a baseline you may try to access your Athena database with SQL Workbench. Please find the detailed documentation on the above link. In order to use the JDBC driver with Information Design Tool, you would also need to add the Amazon SSL certificate to the Java runtime. (SQL workbench doesn’t require this, but IDT would throw an error if it can’t find the certificate in the keystore.) You need to add the certificate to the java keystore with keytool. Once you located them, create a directory under each \bin as \certs and copy the Amazon certification there. Note that you should get “Certificate was added to keystore” four times! Unortunately it won’t throw a loud error message if it fails. Add the following definition to the Databases node, similarly to the default Amazon Redshift. This needs to be done on the server and on the client machine of the IDT. If all went well, we have a successfull connection! Not the good type though. There’s an issue: inserting a table with IDT on the data foundation fails. This setup connects SAP BusinessObjects’ leading enterprise BI capabilties with one of the best and most affordable big data services.